The European vector of Russia’s foreign policy has been one of the most intensive, most problematic and most promising. And it seems reasonable to assume that this will remain so for the foreseeable future. The Institute of Contemporary Development presented in July the results of a study of the main areas of Russia-EU (Moscow-Brussels) relations for the past decade. The study, authored INSOR’s Director for International Development Sergei Kulik, is a sort of reference book, including general overviews, forecasts and recommendations. A copy of the report in Russian is available here. The Baltic Forum, an international nongovernmental organization, held its annual conference in Latvia on May 25-26. The event was organized in cooperation with Institute of Contemporary Development, a partner of the Baltic Forum. The conference was dedicated to pressing and complex issues on the global agenda, in particular, questions related to instability in the Middle East, the impact of internal political changes in a number of key states on the development of international security dialog and responses to economic challenges, the impact of the Eurozone crisis on the situation globally and regionally and on relations with Russia and its Asian partners, in particular. 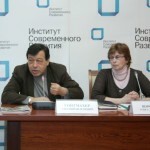 Improving Financial Literacy in Russia: How Can a National Strategy Be Developed? The Institute of Contemporary Development hosted a roundtable titled Improving Financial Literacy in Russia: How Can a National Strategy Be Developed? The event was organized by Russian National Association of Securities Market Participants (NAUFOR), the Committee for the Development of Pension Systems and Social Insurance of the Russian Union of Industrialists and Entrepreneurs, and Econometric Unit VEDI. The Institute of Contemporary Development hosted a meeting with a delegation from the Center for the National Interest, a US think tank that is allied with the Republican Party. The delegation was led by Dmitri Simes and the discussion focused on Russian-American relations following the presidential elections in Russia as well as how the situation is developing in both countries. The Institute of Contemporary Development was established four years ago in March 2008, when the newly elected Russian President Dmitry Medvedev became chairman of the think tank’s Board of Trustees. A special meeting was held at INSOR on March 20 to review the results of the organization’s efforts. The Institute of Contemporary Development hosted a meeting with a delegation from the Center for International Public Policy Studies (CIPPS, Japan). The participants discussed issues concerning the modernization of the Russian economy. Short presentations were made by INSOR Director for Social-Economic Development Evgeny Gontmakher and Senior Advisor Nikita Maslennikov. The CIPPS delegation included former Japanese Prime Minister Junichiro Koizumi and the directors of top Japanese companies. INSOR Management Board Chairman Igor Yurgens and Director for International Development Sergei Kulik participated in the first conferences of the Council of Councils, a new international think tank organization created on the initiative of the Council on Foreign Relations. For more information, see the CFR website. The Institute of Contemporary Development held a roundtable called “No Immigrants. What Should Be Done?” The discussion focused on whether there are alternatives to immigration from abroad to help resolve the looming crisis on Russia’s labor market. The event was organized by the Moscow Psychosocial University (MPSU), Institute of Contemporary Development and the Academic Research Center for Social-Economic Population Issues (MPSU). Opening the discussion, INSOR Management Board Member Evgeny Gontmakher noted that the present economic situation in Russia is quite complicated. “The entire resource of the economy is in people. Thus the problems of immigration are coming to the forefront,” he emphasized.